So Glasgow is heating up nicely getting all ready for our summer weather, topping 24 degrees on the good days, its nice in the sunshine. But if you are an avid reader of Nic n Cher you will know what the warmer summer weather brings, yip you are right, THE SEPARATION. Quick Recap if your a new reader: Every year Nic n Cher need to endure 3 full months apart. Cher tells me it is so she can visit her family in Winnipeg but I secretly think she goes to Re-Hab to dry out. It has been a heavy first half of the year, we have been on tour quite a few times including SES NY and Liverpool, check out the flickr, its all there. Anyway my summers are lonely, fun free, party reduced, brain storm minimized and all round flat. Never mind eh we have Google Talk, and lots to be getting on with, busy work work work. Never a dull moment in this industry. I am sure the months will fly and we will be back on track with our touring before you know it, PubCon Vegas baby… Oh did I tell you, we may get married while in Vegas, we’ll keep you posted. 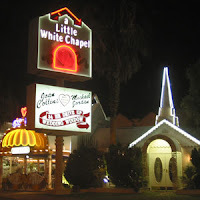 Little White Chapel of Love anyone….